Please join us on Saturday, 9/22 from 9:00AM-Noon in front of our building (6228 N. Broadway). 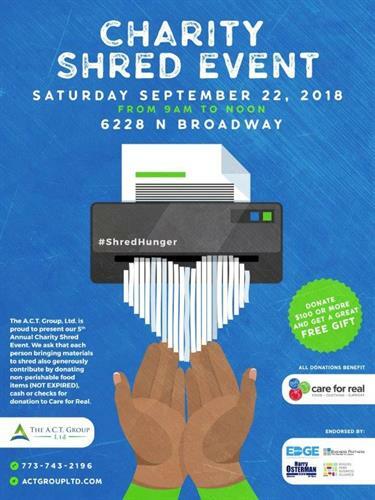 Bring your shred and a generous donation (!) of check (made out to Care for Real), cash or NON EXPIRED non-perishable food items. All donations benefit Care for Real. Last year we collected almost $3500 in cash/checks and almost 250 pounds of food. 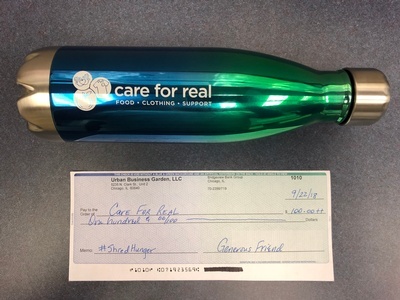 AND...anyone donating $100 or more by cash or check will receive an h2go insulated cup that really does keep liquids cold for 24 hours or hot for 12!